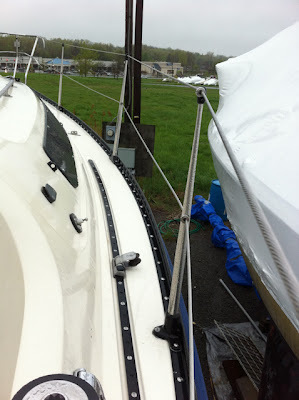 A special thanks to Rigging Only for doing an incredible job on my new lifelines and making me a happy customer. The turnbuckles at the bow look like a work of art. The bare stainless wire looks very sharp, and at its thickness are pretty much unbreakable. Installation was pretty much mindless threading through the stanchions. There are technically two jobs remaining before I can really call this job done. First, I need to polish the stainless pelican hooks I re-used. They clean up nicely, but really need to be cleaned up. Second, the stanchions have a sort of modified sleeve bushing used to protect the lifeline from the raw edge of the stanchion cut-out on the lower line. These are now 30 years old, and badly UV damaged to the point of being brittle. My current plan of attach is to order grommets from McMaster Carr. The stanchion hole is approximately 1/2" and the lines are 3/16" with slight larger fittings to pass over, so we'll call it 1/4". I ordered the military grade model hoping that its formulation would include improved UV resistance as I'm told these don't last long. I had to order a bag of 100 for less than $10, so that's about 10 years worth as a conservative estimate. I also noted that I can order sleeve bushing in roughly identical size for around $3 each. That's a lot more money, so I'm hoping this will do the trick. I'll know by the end of the week and will update this entry when I have a definitive answer.